The pumpkins are out in full force! And if you haven't visited your local grocery or my personal favorite, a pumpkin patch, you should! Pumpkins are one of the reasons why I love fall so much. 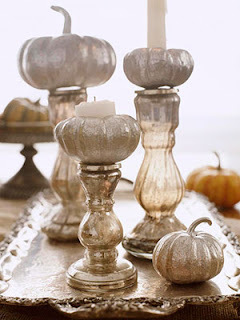 They are pretty inexpensive and can be used to decorate in many ways. In fact, they can be used in so many ways that I will have to do multiple posts just to show you all of the great ideas I've been stashing away. But enough of the talk. 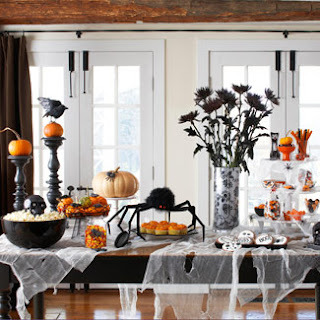 Let's get to the pictures and start decorating! If orange just doesn't do it for you, this idea is for you. Creamy whites and neutrals make up this center piece of pumpkins, gourds, wheat and candles. Effortless and beautiful. I've shown this picture before, but I had to show it again because I just love it. I think it may be the cutest "Boo" I've ever seen. 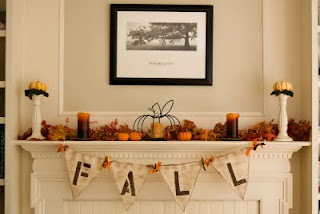 Using pumpkins as a canvas for a message is a great idea. 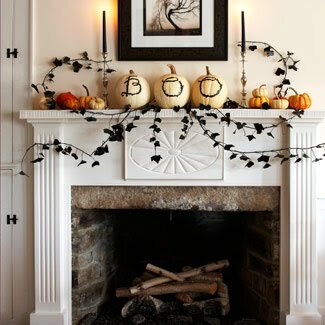 I love the little pumpkins resting on the moss and candle holders on this mantle. But what I also really love is the fall banner. What a simple way to add some seasonal flair to your mantle. Similar to the idea above, the pumpkins take the place of the candles and look great on a Halloween party table. 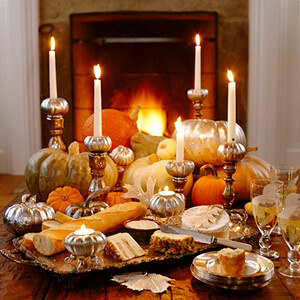 A little silver spray paint, some candles and mercury glass candle holders help create this elegant table setting. 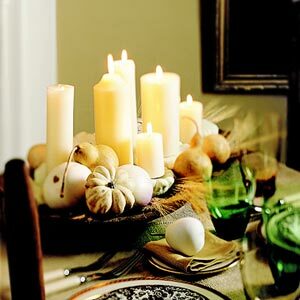 Here is the same idea but with a more color and scale due to the larger pumpkins added to the mix.